Maggie is an Apocalypse World refugee who was on her way to the satellite colony set up by Mary and Jack in Dayton, Ohio, when her group was attacked by a nest of vampires, taking their numbers from nine to two by the time she and Floyd meet the Winchesters. While being attacked by a vampire, Maggie's screams alert the newly arrived Winchesters, Castiel, and Gabriel, who arrive to save her and Floyd. Maggie reveals their group was attacked by vampires in the Morehead Tunnel on their way to the newly set up Dayton outpost, and they join with the Winchesters on their journey to Dayton. In the Morehead Tunnel, Castiel and Gabriel are moving rocks blocking a passageway when the group is attacked by vampires. As a pair descends on Maggie, she is rescued by Dean. After Sam is killed and dragged away, Maggie attempts to console Dean about his "friend", but is met with a glare from Dean as he continues forward. The group soon arrives to the outpost, where Castiel is unable to continue due to the warding sigils. 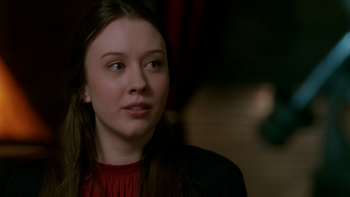 After Gabriel breaks the warding, the group is met by resistance fighters and Mary. Maggie is one of the many Apocalypse World refugees to cross over through the rift. Along with everyone else, Maggie enjoys a beer in the Bunker to celebrate their escape from Michael. Maggie's beaten and bloodied body is found off a wooded trail by Mary and Bobby while they are out on a walk. They call Sam, Dean, Castiel, and Jack to the scene, noting that the death doesn't look supernatural. They bring her body back to the Bunker where Mary and Bobby theorize who could have killed her, when Jack and Lucifer suddenly arrive. Jack tells Mary that Lucifer will resurrect Maggie; though apprehensive, Lucifer agrees and brings Maggie back to life. A little shell-shocked after her resurrection, Sam begins questioning her about what happened. She asks Sam if they have more pressing matters than her; Sam tells her they do, but that she also matters to him and asks if she saw her attacker's face. Maggie tells him she didn't see his face, but she did see his glowing red eyes. When Michael arrives at the Bunker, Sam has Mary and Bobby take Maggie out of the Bunker through the garage before Michael can get in. When Sam reveals to Jack Lucifer's hand in Maggie's death, he compels Lucifer to tell him the truth about Maggie. Under Jack's powers of compulsion, Lucifer reveals that Maggie found him scouting the Bunker, and that when she screamed he crushed her skull with his bare hands and enjoyed it. In the Bunker, Maggie is tending to a hunter who has been wounded by a rawhead, removing a tooth from the man's shoulder. When Sam gets news of a band of vampires working their way down the highway, he asks Maggie if she can hack the traffic cameras, which Maggie tells him she cannot. After Sam gets a call from Kipling looking to make a trade with Sam for Castiel, Maggie joins with Bobby and Jack on the way to the rendezvous. Maggie and Jack are quickly captured by demons and brought into the bar. When Bobby and Mary barge in firing their guns, Maggie hides behind the bar. After Mary kills a demon with an angel blade, she hands it to Maggie who uses it to save Mary from a demon. As Maggie struggles with another demon, Sam is able to call the demons off after killing Kipling, causing the demons to smoke out and escape. Maggie is assigned her first solo hunt in Claremore, Oklahoma. Nervous and excited, Maggie texts Mary and Bobby for advice on how to go about her suspected ghoul hunt. When she arrives at the Rawling estate, she enters the family mausoleum, where she is attacked by a ghoulish-looking Patrick Rawling. When Maggie fails to check in with Sam, he checks his computer, revealing to Dean he has implemented body cams for the hunters, and watches as Maggie is attacked. Believing there is a chance she could be alive, Sam and Dean head to Claremore to find out what happened. When Sam and Dean realize something is protecting the attic in the Rawling home, Sam investigates and finds Maggie strung up, still alive and being drained of her blood. When she comes to, she warns Sam of the thing in the attic -- a vampire from Apocalypse World, which Sam pierces in the chest with his machete, causing it to explode into dust. At the Bunker, everyone celebrates as Maggie is safe and sound. Despite her harrowing experience, Maggie tells Sam she can't wait to "get back in the saddle again." Maggie calls Sam to tell him she has gathered as many hunters as possible to try and stop Michael's army. She notices that none of the monsters are killing, only biting and scratching -- trying to infect people. Sam tells her they are at the Hitomi Plaza and have captured Michael. She says they will get to him as soon as they can, but Sam tells her not worry about him and to focus on saving as many people as they can. Maggie calls Sam once more, only to find that the group are now back at the Bunker. Sam asks Maggie to check on Garth, whom they left in the trunk of the Impala. Maggie goes on to tell Sam that the monsters have stopped attacking and appear to be heading west, towards the Bunker. Maggie and the rest of the hunters set up a road block to try and prevent any monsters from getting to the Bunker. As a van slowly rolls to a stop, the group find that it is empty. A hunter named Tiger follows tracks into some brush; after coming out he tells Maggie their tracks went around them and are probably headed for the Bunker. Maggie and the hunters make it to the Bunker, only just ahead of the monsters. When Maggie tells Tiger to lock the door, Tiger reveals himself to be a shapeshifter, having killed Tiger and assumed his identity in the brush, and shoves Maggie to the ground. In the aftermath of the attack, Sam thanks Maggie for saving them from the monsters. She replies that it was Jack who saved them, telling Sam she didn't know he could still use his angel powers. Maggie is killed by Michael. Stumped on how to deal with the gorgon, Sam places a call to Maggie, who looks through lore books and finds the only way to kill a gorgon is to decapitate it with a silver blade, remarking that it's too bad it couldn't be bullets. When Sam asks her how things are going at the Bunker, she tells him it is quiet. Sam thanks her for stepping up while he is gone before hanging up. When Sam brings an injured Dean back to the Bunker, Maggie goes to get him ice for his head injury. When Michael is able to escape from Dean's head, Sam and Dean hear Maggie scream and rush into the library where they find all the hunters dead. As Maggie runs in screaming for Sam, her eyes and mouth fill with an intense light as she is killed via smiting. It's mentioned that Maggie and the other dead hunters have been given a Hunter's Funeral Pyre. Maggie's death continues to haunt both Sam and Jack, to the point that Sam doesn't even want to spend time in the bunker. Maggie is the last person killed by both Lucifer and Michael before each of their respective deaths.